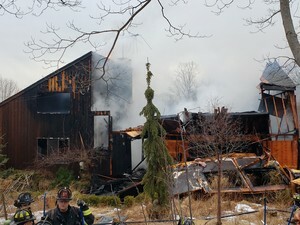 Lewisboro, New York – On March 13, 2019, the New York State Police, Lewisboro Police Department, and Vista Fire Department investigated a house fire on Smith Ridge Road in the town of Lewisboro. Lewisboro P.D. and Troopers responded to Smith Ridge Road in the town of Lewisboro for a report of a man running through the neighborhood. Upon arrival, it was discovered a residence on Smith Ridge Road was fully engulfed with flames. South Salem Fire Department, as well as adjacent fire departments, responded to extinguish the flames. The homeowner, Stephen McMahon, age 58, was found suffering from burn wounds in the nearby woods. McMahon became combative with EMS personnel and was taken into custody in order to provide needed medical care. McMahon was transported to Westchester Medical Center. This investigation continues to be investigated by the New York State Police and the Westchester County Cause and Origin Team.